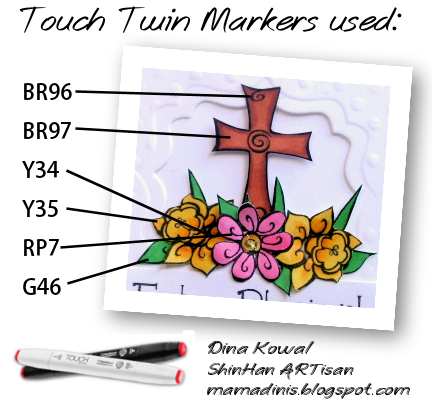 The sweet and talented Trudy Sjolander has a new stamp release available through Inky Antics! How fun to get to help her celebrate, along with this fabulous group of designers! If you just happened on the blog hop today because you're a regular reader of my blog, and you'd like to view the entire hop, you can start back at Trudy's blog - you'll find a full list of participants there, and all the details you need. If you're already hopping and you arrived here from my friend Bev's blog, you're doing just fine. I went with a clean and simple layout and design on this card, because I wanted the images of the Swirly Easter set to take center stage. I colored the images with Touch Twin Markers - the colors I used are below. I created a window with a small Sizzix die - Love the wide border on these for window cards! I ran the die and a Fiskars embossing plate through my Big Shot at the same time with the embossing plates before cutting the window out. 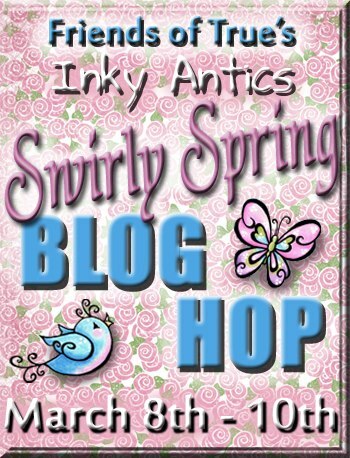 There will be a prize package donated by Inky Antics that includes True's entire, newly released, Swirly Spring stamp line, so be sure to leave comments all along the way for a chance to win! One lucky commenter from a randomly picked blog will win all 6 stamp sets! The winner will be announced on True's Blog on Monday, March 11th. Your next stop on the hop is Colleen Schaan's blog! Thank you so much for visiting me! I love how you make your CAS cards look so beautiful my friend! Absolutely brilliant Dina. Love the texture and pop of color in your beautifully die cut window! I love you CAS card! It perfectly showcases your image and message. TFS! Beautiful use of color and creativity. Like the die cut window!! Wonderful creation! Love the cutout with the focal image over the top of it! Awesome design. What a lovely Easter card. Love the layering! Beautiful card! Love the simple design and beautiful coloring! 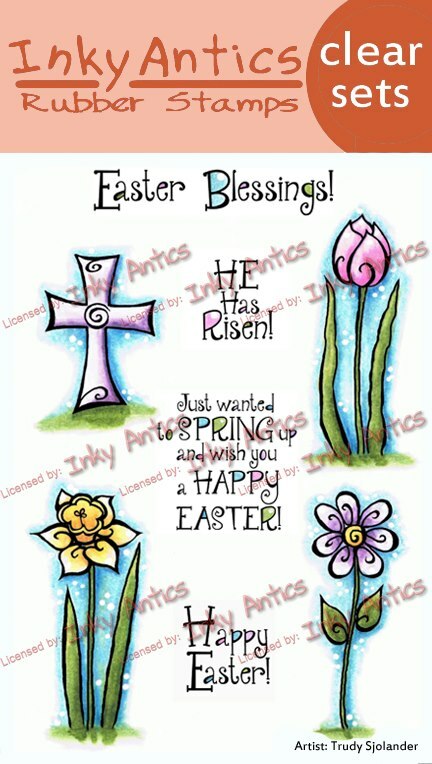 Great Easter card. Thanks for going the extra mile with giving colors used. Thanks for sharing. Love how you have framed and set off the image that, together with the colouring, really showcase how lovely the stamps are. Fabulous. What a beautiful card. I love how you did sunk in frames to showcase the focal image. Lots of dimension and the coloring is super wonderful. Your card is clean, simple and beautiful! Your card is absolutely heavenly! What a sweet card! thanks for posting colors also! Beautiful. This set is on my wish list. I love your card. The Easter set is my favorite so far but I'm not half through the hop so will continue to check out the blogs. Your card is so beautiful. I love it! 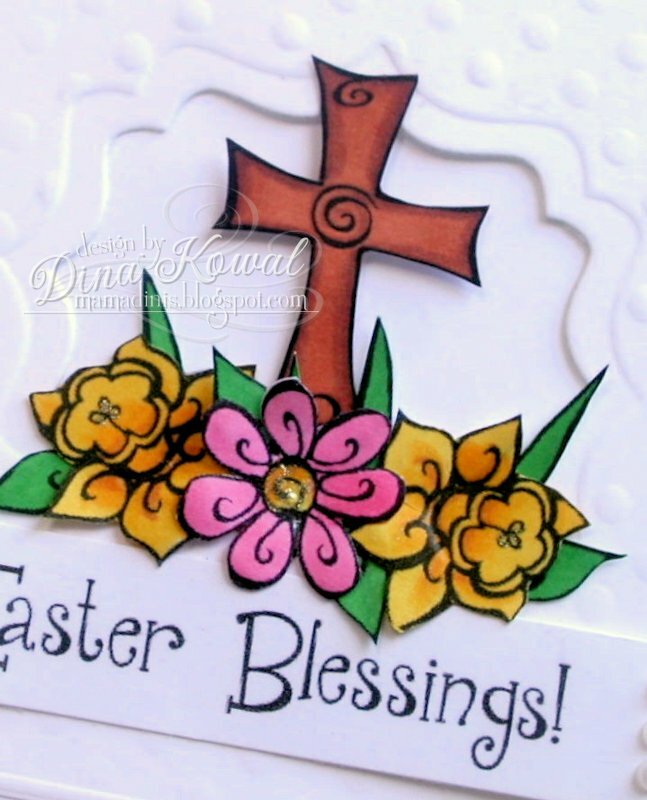 Great Easter card....love how you have framed the cross in the background and the lovely colors of the flowers. Beautiful. This is so strikingly beautiful! Love how it pops off the card! Ahhhh, Dina! So beautifully elegant and classy! Hmmm...never thought to use a die with an embossing plate but I don't think I would use one with an embossing folder. Also love the flowers at the foot of the cross. Thanks for sharing your gorgeous creation using this stamp set. Very elegant in its simplicity! What a lovely Easter card. Thanks for the inspiration. I think this is the best card in the hop. I love the bright color against the white! Lovely Easter card! Great coloring and love the window opening in the card front! So, so elegant and pretty. Love the coloring and the pretty cross. I have many people who would enjoy these cards. You did a beautiful job! Bright colours and a beautiful card. Love the tulip in this stamp set the most. I love your card, (very much my style.) Great job. Nice card. I love the window in the card. Thanks so much for the color instructions! i adore your card so much! the way you created the window with the dies and then placed your images in front of it - LOVE! I also love how you added your colors with the arrows like that. Brilliant.